When someone thinks "destination wedding" visions of Tahiti, waterfalls, and exotic foliage generally pop into one's mind. Destination doesn't always have to mean "exotic", or "tropical" for that matter. I actually prefer the destination weddings that allow guests to visit a place nearby they may have never considered as a vacation destination. Savannah, Georgia may not be bursting with macaws, a lush rainforest, or drinks dressed with sticks of fruit, but it is a city that has all the makings for a perfect destination wedding. The place you stay can make all the difference when exploring a new destination. 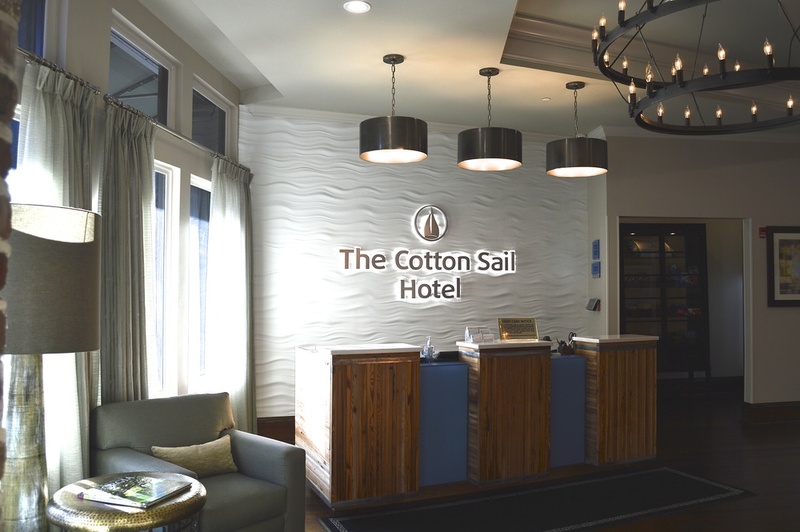 During our stay in Savannah we were welcomed by the newly renovated Cotton Sail Hotel. Our room overlooked the breathtaking Savannah River, was steps away from every delicious restaurant on River Street, and central to practically everything Savannah has to offer. We had the opportunity to talk with Ana, the hotel's Director of Sales, and were given a snapshot of the story this gorgeous hotel has to tell. From the original Savannah grey brick made from the Savannah River's mud, to the wood floors reclaimed from 500 year old heart of pine trusses there is a comforting and established sensibility to this new hotel. Before becoming a hotel the building was a cotton warehouse, general store, and office for the Cotton Sail Shipping Co. There is a true appreciation for the history of the town, and it is clear the business owners do all they can to maintain the integrity of that history. The Cotton Sail Hotel can accommodate wedding parties the size of 100 and features an event space overlooking the Savannah River. There is an indoor space, allowing for a dance floor and reception seating, as well as a deck featuring river views. A hallway away is the Top Deck restaurant and bar, allowing guests to enjoy a nightcap before retiring to their rooms. We visited during a cold snap and Ana assured me there are outdoor heaters available when the temperatures happen to take a dip. The staff was unbelievable friendly, and we were able to experience first hand, that contagious Southern charm. There is so much to do in Savannah that we ended up extending our visit an extra night. The town is historic, artistic, charming, and tailor made for a destination wedding weekend. Ready to book your trip and make Savannah, Georgia your destination wedding location? Contact us at hi@jennydoesweddings.com and we will help you plan the perfect Savannah wedding! Special thanks to Ana and the Cotton Sail Hotel staff for making our visit a memorable one.